Warming, stimulating and toning. 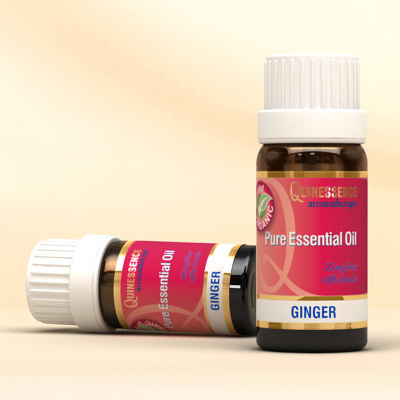 Distilled from the roots of the plant, this organic Ginger Essential Oil is certified by ECOCERT and has a wonderful fresh, warm and spicy aroma that is strengthening and stimulating to the digestive and circulatory system. In massage blends Ginger Essential Oil has a positive action on the digestive system, helps maintain joint mobility, and eases every day muscular aches and pains. A few drops inhaled from a tissue helps to ease nausea and motion sickness, especially when used in conjunction with peppermint essential oil. Since Ginger Essential Oil is an arterial stimulant it can be used in skin care to bring life back to a dull, tired complexion, and it encourages strength, determination and clarity for those who lack confidence or have lost their motivation.